Hi All, Susan Sipal here. As many of you know, Martina Boone, our founder and leader of this awesome blog, celebrated a book birthday this week! 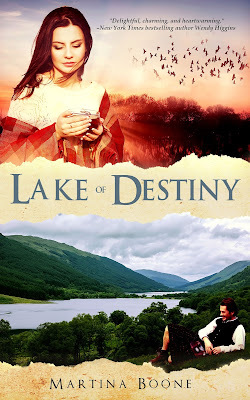 Her newest release, Lake of Destiny: A Celtic Legends Novel, is an adult contemporary romance set in the Scottish Highlands with just a touch of magic. It’s written with warmth and humor, which is the combination I love best. I was fortunate enough to be a beta-reader for Martina, and since I loved the novel so much, I decided to create a new playlist on my YouTube channel and start A Touch of Magic BookTube Reviews. Anna Cameron is healing from wounds of the past while courageously forging a fresh path for herself by starting a new career in a foreign country. Connal MacGregor is a man who could have had it all, but turned his back on the glitz and glamour of Hollywood to protect his most prized treasure – his young daughter. The two come together to not only help a small town in need of economic revival, but to push each other in their own personal recoveries. Please check out my full review of Martina's novel in the video below and subscribe to my channel if you'd like to see more. If you're a Wizarding World fan, I hope you'll also check out my playlist for Fantastic Secrets Behind Fantastic Beasts. You can also enter to win a paperback copy of Lake of Destiny by clicking the link toward the end of the video. What if you met the person you knew you were destined to love? Would you tell them? Lake of Destiny is a magical Highland romance about men in kilts, destiny, family, healing, and the sometimes twisted path to love . . . Helping her aunt organize a Beltane Festival in a picturesque Highland village seems like the perfect escape from Anna's second broken engagement and the meltdown that wrecked her legal career. But to succeed, she'll need to wrangle kilt-wearing villagers, dangerous sheep, a disaster of a dog, and the reclusive laird who refuses to open his property to the public for the ancient tradition of "Sighting." For centuries, Loch Fàil in Balwhither has been known to locals as a "thin" place, one where the veil between worlds peels back on Beltane morning to show the face of a person's one true love. The tradition could draw tourists by the busload, but that's exactly what Connal MacGregor fears will reveal the secrets he's been desperate to keep hidden. While Anna struggles to mediate between the needs of the village and Connal's need to protect his identity and his daughter, she finds herself falling in love with all of them: Connal and his child, the magical glen, the villagers. But day by day, opening herself to love exposes deeper scars from Anna's childhood, and confronting those wounds could finally set her free--or endanger her every chance of happiness. Available in hardcover, paperback, and digital. The e-book is $1.99 until Monday, so hurry and get your copy at any retailer. Things are very open and very clean clarification of troubles. Became certainly records. Your internet site is very beneficial. Thank you so much Chris for showing us this put up and giving lots consciousness in this specific subject matter.